The Anthony Gallo Nucleus Reference 3.5s in MY system!!! Well, I guess being one of the first to purchase a set of speakers from an unknown manufacturer, and keeping in-touch, and becoming friends with the head of the company over time, has its dividends I got to be a beta tester for the 3.x to 3.5 upgrade process But better still, I was able to be involved for part of it. I say part of it, because while Anthony and I started on the process mid morning on a Sunday, we were unable to complete the process working well into the evening. I had no idea how complex these speakers are. There are a lot of parts that need to be assembled, just so, in-order for the things to work, and the interior of these speakers is far more confined than a typical box is. So while Anthony and I nearly completed the upgrade of one speaker that Sunday, he had his assistant complete the second during the week and I was able to pick-up both upgraded speakers the following weekend. This upgrade is a very labor intensive process; I'd say it's probably 8 to 10 man-hours per speaker. As far as the sound goes, well I've now finally had a chance to listen to the Nucleus Reference 3.5s in MY system, and I can say with confidence that they are a game changer! After I sold my original aluminum sphere Nucleus Reference system, and replaced them with the Reference 3.1s, I was never 100% sure I'd done the right thing. In my system, I feel there was an immediacy and liveliness, that I felt I'd lost with the change. The sound stage was there, accuracy was there, but I think the PRaT and dynamics were somewhat missing. So reading about peoples' experiences with high powered amplifiers started me thinking in that direction, but I never pulled the trigger. With the 3.5 in my system that "life" is back in spades! These things are amazing; the increased immediacy has also increased the depth of the soundstage both in front of, and behind the speakers. I thought listening to Peter Gabrial's "Growing Up" from "Up", on the 3.1s was pretty impressive, with the sound seeming to come from far behind the speakers and as far forward as half-way into my room. With 3.5s the sound caused my room to disappear, with sound coming from places far beyond all the walls, even seeming to come from behind my listening position. Listening to NIN's album "With Teeth" put Reznor front and center in my room about 2 feet in front of the plane of the speakers with the band spread out behind him. Listening to Filter's "Title of Record" when track 2 "Welcome To the Fold" begins without any pause from track 1 "Sand", the thwack on the Tom-Tom caused me to jump out of my seat. The 3.1s never elicited as strong a response. Listening to EMI Classics Mstislav Rostropovich J. S. Bach Cello-Suiten 1, 4 & 5 I could hear all the detail as the bow was being dragged across the strings, I could hear Mstislav inhale and take a breath between notes, I don't recall hearing some of these little details as clearly with the 3.1s. Listening to Tori Amos' "Little Earthquakes", the drum on the opening track "Crucify" is wonderful, with an obvious sound of the head of the stick hitting the skin, and then a slow rumbling decay, and all of it can be heard and felt. 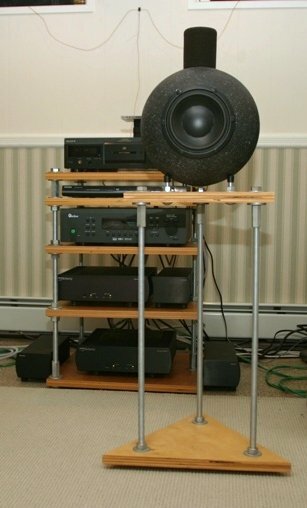 Re: The Anthony Gallo Nucleus Reference 3.5s in MY system!!! Nice review Barry! I was VERY impressed by the satellites we heard at the rave. They saw right through to the music! Enjoy! Nice review. Do they still look the same as 3.1? nice review Barry, looking foward to hearing them. If you are having a rave in June, you will get lots of toys to try to power those new speakers, Just ask and I can see clearly a pair of Butlers, a few SS amps and a tube amp or two! yup... but I had the stack of balls not the solos, the nucleus reference.... I liked the dynaudio drivers he used to use. The tweeter is up for debate as to whether or not the more directional new one is better or worse than the old one. But what I had at the time as far as electronics and such was really good sounding match overall with them. Hey Shane, Well those are the Solos I bought from Anthony back in '94, and I still use them. A month or so after I picked them up I went back to Anthony to pick-up a set of the "Base-Balls" to turn them into a "Reference" set. Later, I think in '98, I went back to have my speakers up-graded to the aluminum spheres. I ended up keeping my original Solos and getting a set of aluminum sphere'd References. Those are the speakers I sold so that I could afford buy the 3.1s. I still miss those speakers but now it's based on sentimentality/nostalgia instead of performance. Hey Mike, Yeah, Srajan really digs the Strada system. I'm curious to read his review of the 3.5.
ooh Barry Your famous. We must make a baby. Soon! "His tightly compacted MTM cluster too gets as close to a wideband point source ideal as seems possible with three drivers." "The Reference 3.5 doesn't sound as spectacularly fast as the Italians and Indians because its dynamic response is more linear and its integration of the power region with the higher bands superior." "The Reference 3.5 adds a bit more air volume to the woofer and builds in perfect bass integration"
"It speaks very highly to integration benefits of Gallo's latest refinements." "My personal speaker journey has presently climaxed in Franck Tchang's €18.500/pr ($27,750) Tango R. The Gallo Reference 3.5 now turns out to be a true kinsman covering the same sonic bases." He may not have been blubbering about how absolutely amazed he was, but he sure did sound like he thought they were, as good as, or better than, far more expensive speakers. I like that about Srajan...that he doesn't blubber but chooses his concluding remarks carefully. He's a good reviewer, as are the others on his staff. He's even toned down his English a bit! (for us commoners).